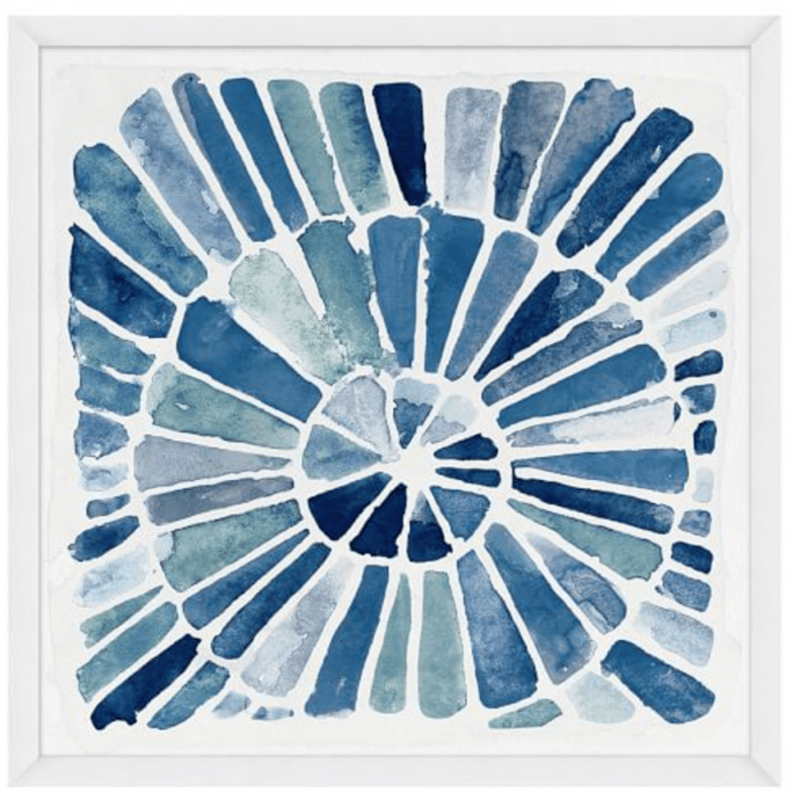 Are you obsessed with all the blue home decor that’s currently in stores? I certainly am. For the first time ever I’ve been ahead of the trend since I’ve always loved decorating with blue. And even when it’s no longer trendy, I will still be decorating with it. Blue is my color, always has been! Using the different shades of blue in the PB art as inspiration, I grabbed my paints, some chunky paintbrushes (that may or may not belong to my toddler!) and some watercolor paper and got a little creative. Some brushstrokes here, some brushstrokes there….and I was done. Then all I had to do was cut each piece to size and frame it. You can see how different colored frames create different looks – modern, beachy or dramatic. Don’t the blues and greens look so pretty paired with the gold frame, too? I made all of these in about 15 minutes using supplies and frames that I already owned. Free art is the best! I’m digging the blues with a pop of green. You should incorporate whatever colors work with your decor – whether that means adding some gray, beiges, pinks, red or whatever your heart desires! Get creative! 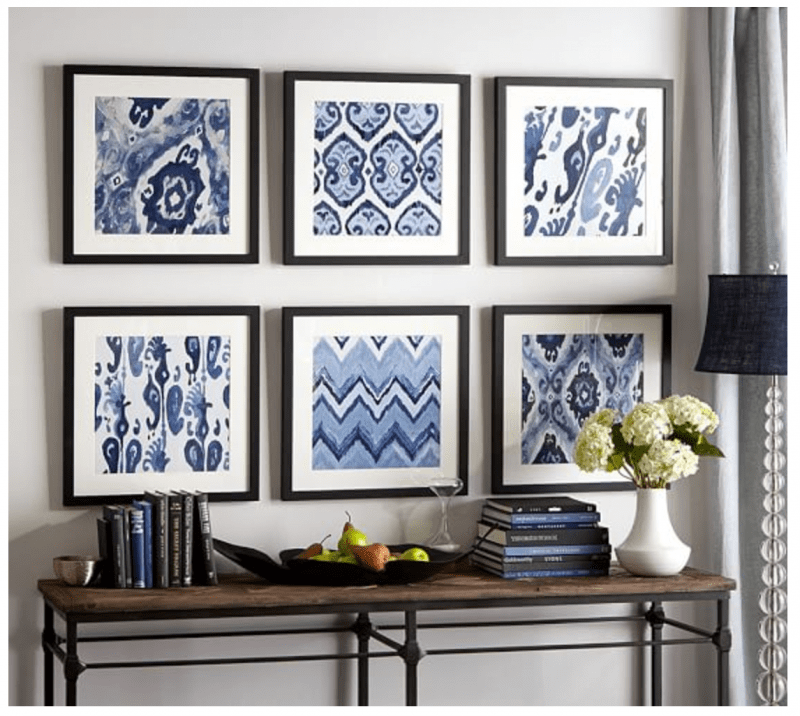 Hang your new artwork on a wall or add them to a style shelf or mantel. Is this a project you’re going to do? You’ve got nothing to lose – if you can swipe a paintbrush left to right you’ll be able to create your own beautiful DIY wall art! AH!! You just confirmed my belief that DIY Abstract Art IS possible and if I may say so, sometimes better than, the over-priced store bought variety. I love that it’s personal and that you feel creative pride, as everyone says “ooooh and ahhhh” over them. I cannot wait until I get to the point in my decorating when I too can create like a “master” ;) Have a great day and love your site!! Those inspiration pieces are gorgeous! I love how you created your own designs based off of them as well. It definitely makes me want to go get some watercolors and watercolor paper.